“His dialogue always seeks to manipulate, deceive, seek space, stop the political momentum and then repress. We do not agree with a dialogue that is made to deceive,” Vecchio said during a debate on Venezuela at the Atlantic Council think-tank in Washington. Vecchio said the opposition is not “willing” to participate in the dialogue on the “terms” of the Chavista authorities and that “the only thing” they are willing to discuss is the “agenda” of Guaidó to achieve the “exit” from power of Maduro, occupant of the president’s office of Venezuela since 2013. As justification for his response, Vecchio referred to the failure of previous attempts at dialogue, including the one that took place in 2014, after days of violent protests, and the one initiated in 2017 in the Dominican Republic with the participation, among others, of the former president of the Spanish Government José Luis Rodríguez Zapatero. “We are not performing an abstract analysis (…) one cannot be manipulated again by the dictatorship,” said Vecchio. This was the initial response of the Venezuelan opposition to the offer of dialogue made by Maduro today in an interview with the Russian agency RIA Nóvosti. Russia is prepared to participate in “international formats” of mediation to try to resolve the current situation in Venezuela, said Foreign Minister Sergey Lavrov. “We are ready to participate in international efforts (mediation) in those formats that are acceptable to the Venezuelan parties”, the head of Russian diplomacy told a joint press conference with his Iraqi counterpart, Mohamed Ali al Hakim. But the president of the United States, Donald Trump, is far from considering any proposal of this type and this Wednesday reiterated, via telephone call, his “full support” for Guaidó, the parliamentary leader explained in a message on Twitter. “I appreciate the call of the president of the United States, Donald Trump, who reiterated full support for our democratic work, commitment to humanitarian aid and the recognition of his administration of our presidency (in charge),” Guaidó wrote on his Twitter account. US President Donald Trump had boasted shortly before that Nicolás Maduro was “willing to negotiate” with the opposition thanks to “US sanctions” on oil revenues. The leader recommended that US citizens not travel to Venezuela “until further notice”. “Maduro is willing to negotiate with the opposition in Venezuela after US sanctions and the reduction in oil revenues,” Trump wrote in his Twitter account about the measures taken by Washington on Monday against Venezuelan state oil company PDVSA. On the verge of a demonstration today called by the opposition, a new diplomatic front has been opened to Chavismo by the president of Chile, Sebastián Piñera, who demanded Wednesday the “immediate release” of two journalists from the National Television of Chile (TVN) who were arrested on Tuesday night in Caracas. “Our Foreign Ministry is taking all the necessary steps. Freedom of the press is another of the victims in Venezuela. The peaceful solution is free and democratic elections, now,” Piñera signaled in his Twitter account. According to TVN, journalist Rodrigo Pérez and cameraman Gonzalo Barahona were detained in the vicinity of the Miraflores presidential palace, headquarters of the Venezuelan Executive. The National Syndicate of Press Workers (SNTP by its spanish acronym) of Venezuela denounced that, along with the Chileans, Venezuelan journalists Maiker Yriarte and Ana Rodríguez of the VPI online channel were also arrested, although these two were freed Wednesday morning. It is believed that the journalists were covering the vigil in defense of ruler Nicolás Maduro convened by the United Socialist Party of Venezuela (PSUV by its spanish acronym) last week. 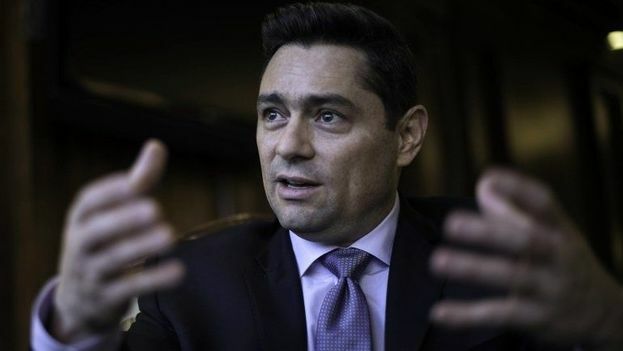 Chilean chancellor Roberto Ampuero said that Roberto Araos, charge d’affaires at the Chilean embassy in Caracas and head of the diplomatic mission in Venezuela, has been working all night to obtain the release of the press team. Chile is one of the countries that has backed the president of the Venezuelan Parliament, Juan Guaidó, as the ruler in charge of Venezuela since his proclamation on January 23. On Tuesday, the government recognized Guarequena Gutiérrez, the diplomatic representative appointed by Guaidó in Chile, and welcomed him. “I have spoken on the phone with President Guaidó, our only interlocutor, to assure him of the support of the European Parliament,” Tajani said at the start of the plenary session of the European Parliament held this week in Brussels. The institution cannot remain “silent” before the latest developments in the Latin American country, said the Italian politician. Previous Previous post: "When We Left We Had No Ceiling in the Living Room, and No Walls"